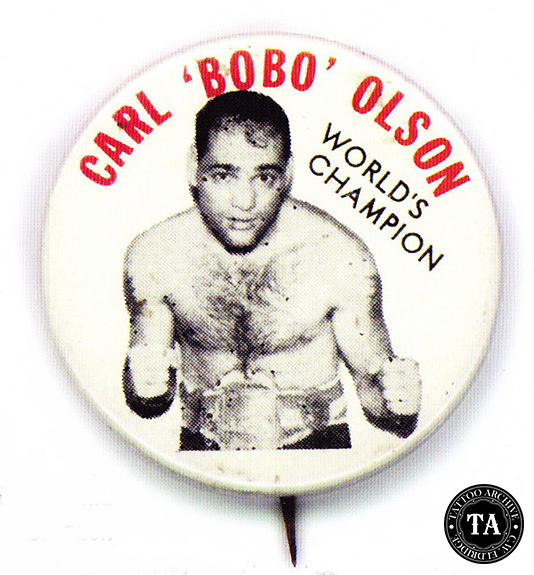 Carl "Bobo" Olson was born in Honolulu July 11, 1928. He began his boxing career in 1945 fighting professionally throughout the United States, Canada, Sweden, South Africa, Italy, Philippines and Australia. 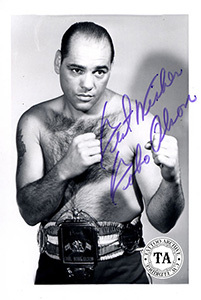 In 1953, Olson was the boxing middleweight champion. He beat the tattooed English champ Randy Turpin in a 15 round battle for the title that "Sugar" Ray Robinson had vacated with his retirement. Long before the latest trend of tattooed athletes, Olson sported two large upper arm tattoos. Today tattooed boxers are not an uncommon sight, but in the 1950s Olson and Turpin were some of the few World Champions with tattoos. In 1951 in Chicago, Olson made his debut before the TV cameras in a bout with Australian Dave Sands. This was the first fight to be telecast coast to coast in the United States and although Olson lost that fight, he appeared on television seventeen time over the next three years. His aggressive style of boxing raised him to the heights as a favorite of the fans. After his defeat of Turpin in 1953, The Ring Magazine named Olson "Fighter of the Year". He defended his middleweight title three times in 1954 turning back Kid Gavilan, Rocky Castellani and Pierre Langlois and engaging in four non-title bouts. In 1954 Olson won the Edward J. Neil Trophy presented by the Boxing Writers as fighter of the year. When "Sugar Ray" Robinson came out of retirement in 1955, at the age of 35, he reclaimed the middleweight title from Olson at the Chicago Stadium. They had a rematch in 1956 and Robinson won again with a knockout in the fourth round. Losing the title forced Olson into temporary retirement but like many boxers, in 1957 the lure of the spotlight and the money drew him back into the ring. Olson had been a professional boxer since the age of seventeen and knew no other way to make a living. It was reported that Olson had trouble with his weight as a middleweight so he returned to boxing as a heavyweight. He had success in this weight class with eight straight wins beating former champ Joey Maxim and also defeating Rory Calhoun and Mike Holt. In The Ring Magazine of July 1964, writer Lew Eskin wrote that, "Olson had gone to war one hundred and one times, losing only thirteen, while scoring forty knockouts. His list of victims include most of the top men of his weight over the past decade and a half." The last bit of information the Archive has on Olson is from a March 1987 article in the sports section of the San Francisco Chronicle. It stated that Bobo Olson received a nice settlement from the Joint Apprenticeship Committee of Operating Engineers as a result of his being fired from his long time job as a physical education instructor.